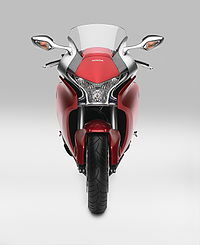 Honda MotoGP V-4 engine technology and architecture bring cutting-edge performance to the VFR1200F. Next-generation shaft drive system with offset pivot point and sliding constant-velocity joint for a new level of shaft-drive performance and control. Saddlebag mounts come standard on both versions of the VFR1200F. This page was last edited on 28 November 2010, at 16:43.